As Vin Scully narrated, Clayton Kershaw (“with a devilish look, like a little kid”) and Scott Van Slyke piled sunflower seeds on the shoulders of an unaware Alex Wood during Sunday’s 8-5 Dodger victory over Boston. 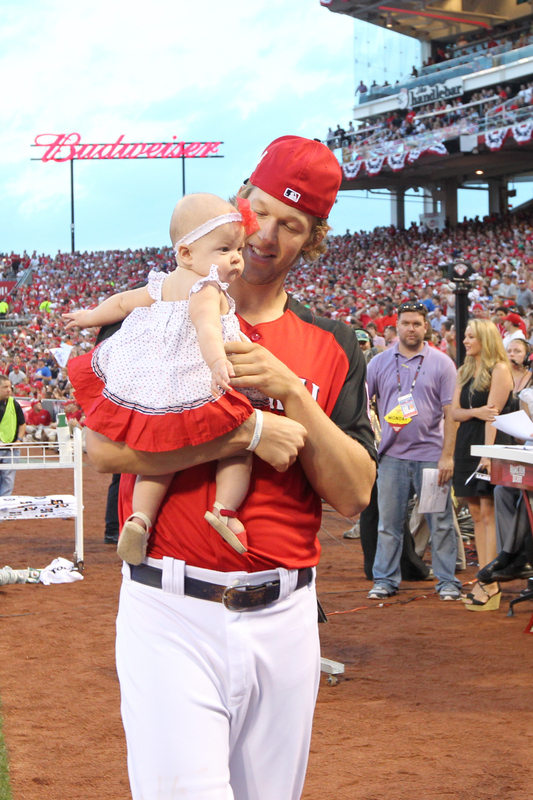 Kershaw played catch before Sunday’s game, so hopefully before too long he has even better uses for that golden left arm of his. Courtesy of SportsNet LA, here’s a fun video of Clayton Kershaw joining A.J. Ellis at a Cowboys-Packers game in Green Bay last month — a day that includes Kershaw picking up the football and sending a pass too deep, and yet shallow, all at once. Dodger director of graphic design Ross Yoshida passed along this video of Dave Roberts when he was the prankee on a September 2003 episode of “The Jamie Kennedy Experiment” on the ol’ WB Network. (Former Dodger catcher Paul Lo Duca is in on the bit.) The Dodgers’ new manager is patient — really patient — but firm and in the end, able to take a joke. Part 1 of the interview between Vin Scully and SportsNet LA’s Alanna Rizzo aired on Thursday night on SportsNet LA, and the legendary Dodger broadcaster gave a priceless response to Rizzo’s question about what the procedure was that caused him to miss the Dodgers’ final homestand and National League Division Series. Scully talked postseason and changing managers, as well. You can catch a longer clip by clicking here. Part two of the interview will air on Monday at 7 p.m.
… Besides being an honor, the All-Star Game was one of the most fun experiences I’ve ever had. When you play against guys, you form an impression of what they’re like. Then you get to spend a little time together and you sometimes see another side. For instance, Adrian Gonzalez. I could never get a read on him because he never really talks to you at first base, unlike some other first basemen. But I talked to him a bit in Cincinnati and he seemed like a really good guy. He was loose and having a great time in the dugout. Yasiel Puig on stage at Saturday’s Dodgers FanFest. 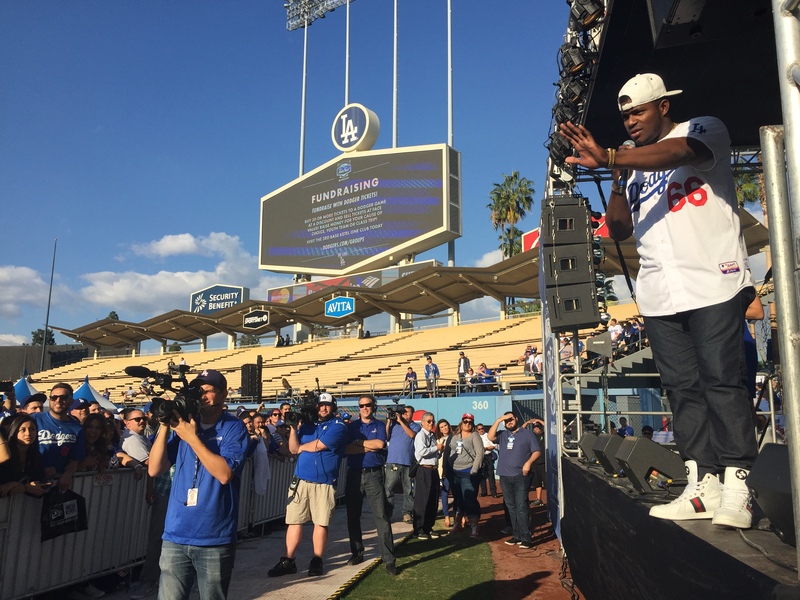 Yasiel Puig stole the show at Dodgers FanFest on Saturday. Puig was the last Dodger to take the stage at FanFest, and in the span of 20 minutes, he started it by answering questions from SportsNet LA’s Alanna Rizzo on stage and ended it by answering fans’ questions on the field. In between, he accepted a fan’s challenge to bowl against him, danced with another fan on stage, played catch with a young fan from the stage, jumped down to hug the fan, took selfies with fans, hugged others and signed autographs. If there were a baby around, he probably would have kissed it.